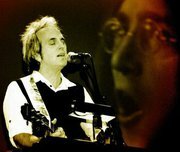 When I heard Glen Burtnik had some free time while stuck in Alaska, I figured I'd ask him a few questions about his upcoming tribute to John Lennon. The show, "John Lennon - 70th Birthday Celebration," takes place at the State Theatre in New Brunswick, NJ on Saturday, February 19. It's another in a wonderful series of tributes Glen has put together for the Beatles and the Who. If you haven't checked out one of these shows, you'll be amazed at how much fun they are. Glen brings in some of his friends from the music business, some local talent, and fills the stage with incredible musicians who offer you the chance to see music that not many of us were fortunate enough to see live the first go around. You've gone through most, if not all, of the Beatles' albums and have done a Who show, what inspired this John Lennon tribute? Lennon was a King. I recently did a show in Manhattan with Lennon's early band, The Quarry Men, as well as Pete Seeger, Neil Innes (of The Rutles and Bonzo Dog fame), Marshall Crenshaw, Tom Paxton -- all celebrating the music of Lennon. I was also at the NYC Premiere of compelling film about Lennon's boyhood, "Nowhere Boy" and I recently picked up a wonderful book about the day John met Paul. This guy is in the air a lot recently, on a lot of peoples' minds. Mine too. I've done a lot of Beatles music in my life. I've reproduced 8 of their albums in their entirety "live" and have performed probably close to every last one of their songs, including tough ones like "Revolution #9" and "You Know My Name (Look Up The Number)". But I am thrilled to explore some of this material of Lennon's as both an Ex-Beatle as well as a mop-top. It is an honorable challenge. Any plans to keep moving further into solo Beatle work? Maybe a Paul McCartney show in the future? Good idea, Gary. We'll see. George Harrison's no slouch either. I wouldn't expect I'd be doing an all-Ringo show right away, however. Who are some of the artists scheduled to take part in the Lennon show? Since you normally handled the Paul tunes, is there one main Lennon singer or several? One of the blasts for me is getting to sing some of John's material. But I'm not alone on this. I have women, girls, kids and a choir diving into this material. No clowns or elephants, I'm afraid. What are some of the tunes people can expect? Does the show follow any particular theme such as chronological by release? John's most popular songs? A blend of greatest hits and obscurities? It's pretty much a balance of things you'd know and obscure material. One of my favorites is kind of new to me, "Grow Old With Me", purportedly his very last song. Thanks to your Facebook posts, I think many people have something of an idea just how much work and rehearsal time goes into these projects but can you give me a little breakdown of just how long you generally spend on a tribute show? I don't know. I try not to count up the time I put in, that only points out how inefficient it all is. I'd probably make more per hour working at a fast food restaurant! These are labors of love for me. If I'm gonna make music for a living, it might as well be for the joy of it, as opposed to...oh well, perhaps being in an Las Vegas cover band...not that there's anything wrong with it. It's all about scheduling. And that's no fun for me. What's the most difficult aspect of putting on a show like this? Technical stuff like informing the production people how many inputs we'll need is no picnic either. Are there any video montages this time around? I believe we'll be stripping things down this time. I like to think John would like it to be more about the music. Finally, what are your three favorite songs by John Lennon? Oddly enough, we won't be doing my favorite, "Cry Baby Cry". There are so many great ones. Today, the way I feel right now, I'll say "A Day In The Life" and "I'm A Loser" could be my other two choices. But that's hard for me to narrow it down, considering the guy wrote things like "Happiness Is A Warm Gun" and "Across The Universe".